Craig Scott has left Phantoms. Phantoms have been dealt a major blow by the departure of their leading points scorer. Craig Scott has notified club chiefs he will not be returning to Bretton next season. The Anglo-Canadian forward was hugely impressive in his first English Premier League campaign and his availability is sure to place other clubs at this level on alert. 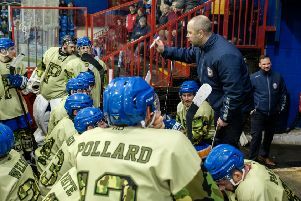 Phantoms coach Slava Koulikov admitted: “Craig did a great job throughout the season to be our highest points-scorer, but I feel we have a suitable replacement in James Archer already signed. Koulikov expects to make more changes to his roster than during last summer. Only three new players - Craig Scott, Lloyd Gibson and import Ales Padelek - were added to the play-off winning squad of 2014/15 for last season. Koulikov added: “It looks like there will be more changes than during last summer and there are many reasons for that. “There are some guys we will be unable to keep and there are others I would like to bring to the club. “Finances will obviously play a part in that, but I’m happy with what the owners have given me for next season. “My job is not just about Phantoms - it also involves working through the whole system from the juniors through Islanders. Defencemen Scott Robson and Tom Norton, and forwards Darius Pliskauskas, Milan Baranyk and James Ferrara are all on multi-year deals.